Thousands of wild horses are living peacefully on public lands right now, completely unaware that the government is coming for them soon. Many will be rounded up this fall, and their advocates have raised serious concerns that they will be sent to slaughter, along with thousands of others. Tragically, the Bureau of Land Management (BLM) has failed, and continues to fail, to uphold its duties under the Wild Free-Roaming Horse and Burro Act, which was intended to protect wild horses from "capture, branding, harassment, or death." It was enacted in 1971, after Congress officially recognized the value of wild horses as "living symbols of the historic and pioneer spirit of the West" who "contribute to the diversity of life forms within the Nation and enrich the lives of the American people." Despite that protection, they continue to be removed from public lands, and thousands upon thousands continue remain warehoused in holding facilities. Unfortunately, those who are supposed to uphold the letter and spirit of the law are increasingly beholden to special interests, including livestock and extractive industries, that want to see wild horses exterminated, and things could soon get worse under the Trump Administration. The House Appropriations Committee recently passed the Stewart Amendment as part of the 2018 budget, which would allow the BLM to send 92,000 healthy healthy wild horses and burros in holding to slaughterhouses, along with those who are deemed excess on the range. What is being done to wild horses at the expense of taxpayers – a vast majority of those who oppose the cruel and wasteful mismanagement of these American icons – needs to change now. The fate of America's wild horses and burros is now hanging in the balance, but there is hope for a way forward. 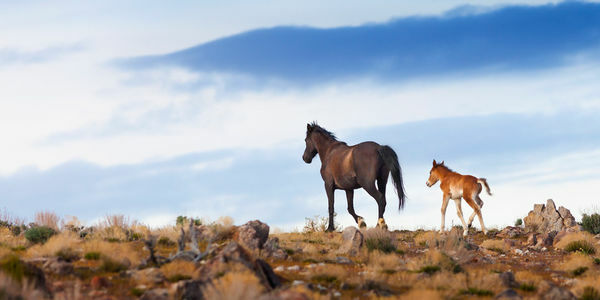 Please sign and share this petition urging your representatives to act to ensure that wild horses and burros are protected from slaughter, and humanely managed on their rightful place on public lands.